Here are a few of the items you can expect from the 60 items by the 24 CFDA designers! I can't wait! Mark your calendars for December 1st. I'm getting this ASAP! I love anything with tortoise shell design so the buttons give this classic a fab twist. Check it out here. Looks like it is selling out fast. Scarf 7, Style 1 look similar to her styling...I have asked Sonjia on twitter how she does her head wraps...hoping she shares something soon. Love the scarf necklace! Will do this ASAP! As it slowly starts to cool down in Arizona for the fall it's fun to start thinking about coats. 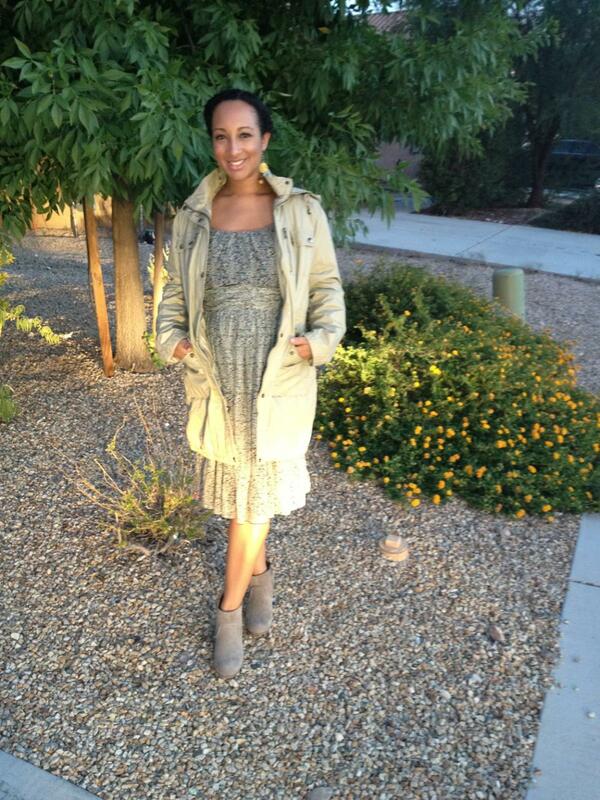 One of the most practical and classic styles to wear in AZ is the anorak. It's not too heavy and so versatile. It seems to add a funky edge to whatever you wear...but, it has also become the new trench. A classic that can be dressed up or down. I love how a belt can transform the look of an anorak that can usually be so casual. The cinching of the waist like the look below gives the anorak more options. How do you rock your anorak? I was given the opportunity of choosing a cute coat from Macy's and style it. I chose the MICHAEL Michael Kors Anorak. Like I said, I like dressing the anorak up with an unexpected pairing. So, I'm wearing it with a flowy dress from Anthro and my go-to-boots this fall from Target. Why did I choose this anorak? I love the brozny color of the hardware. I think it goes with more items not being gold or silver. I'm used to seeing the army green anoraks everywhere, but I found it refreshing to find a neutral khaki color that will go with everything. I also liked that I had the option of removing the hood if I wanted. Sometimes they can be too bulky when you don't need them. I know I'm going to wear this nonstop for years to come. I worked with GigaSavvy on this post. My pinterest page is full of great styling ideas for this staple piece that can easily be paired with a pair of jeans and a cute pair of ballet flats. But, the possibilities are endless. I have been searching for the perfect striped tee forever! I can't decide if I want to make this an investment piece, or go for a bargain and shop at LOFT or Old Navy and the Gap...decisions, decisions. for places to find a great striped tee. Tasha Robinson of Imperfect Concepts online boutique has an eye for finding designer items for her online second hand store. I thought it would be fun to have her share some of her tips and tricks for finding designer items at a great price. Celine tote, Isabel Marant Wedges, Hermes “H” belt are all the must haves of a true fashionista but does one go break the bank just to have the latest and greatest “it” pieces. No, not if you’re a smart resourceful fashionista like I am. You use your resources and score those items at the fraction of the cost. Becoming the envy of all your fashionista friends, Instagram followers and of the blogsphere. I own a Helmut Lang Leather Lamb Jacket retail price $800 but that’s not what I paid. More of $250 dollars was given to my best friend who works at a high-end department store. It pays to have friends in high places when it comes to fashion. At her store they get double time twice a year meaning certain items are close to 70% off. What does that mean for you? Find a good friend at your favorite department store they will give you the heads up when items are going on sale. I lucked and got her discount but you can luck up and get the scoop on Neiman Marcus shoe sale. Are the place to be when comes to get high-end designers for the fraction of the cost. Over the last two years several famous consignment stores across the US have landed reality tv shows. These companies have clients who come in cosign their items they no longer need. If you are looking for a Louis Vuitton Speedy you can possibly find one for less than $500 at your local consignment shop or in-depth search on Ebay. Gucci, Prada, Saks, Chanel, Neiman’s, Fendi and many more have stores in outlet malls now-a-days. I have a personal shopper at most of the outlet stores. Gucci Boston bag for $299 why not. Neiman Marcus tweets out 40% off coupons for the NMLC for additional saving on top of the saving they already have. Two years ago while shopping NMLC I discovered an Escada on the racks by the time I got to the register and not noticing it was additional 75% off the skirt came out to be $14. 24-72 hours to score the deal of your life. Recently Groupon did a Gucci purse sale for 45% off original price marking certain items down to $600. Glit Groupe is the company most people are familiar when it comes to “flash sale”. I remember scoring Louboutin’s for $200. Score of the century to me. Rue La La has had numerous vintage Hermes & Louis Vuitton sales through out the year. All the sites have email list to sign up with so you can be notified when sales will be coming up. Some sites have calendars within their company site. Fashionista you have many avenues to find great designer pieces at the fraction of the cost. Keep your eyes open for sales. It's here! Check it out! Love the styling by Solange and Ty Hunter. Check out style notes from video from MTV Style here. I happened to find out about INKKAS on twitter. After they reached out to me I checked out the selection on their site and LOVED the textiles used for the sneakers and also appreciated the idea that we can give back to people when buying something that we will wear and love. *All of the sneakers come in Men/Women sizes. Inkkas.com is a socially conscious shoe company founded in 2012 by Dan Ben-Nun. The brand seeks to promote beautiful handmade shoes using traditional South American textiles. From the beginning, Inkkas set out to be a company that would have a beneficial impact on the world, not an exploitative one. The company was founded on the principles of fair trade, philanthropy and authenticity. ***Sorry, this is actually happening tomorrow...I was so excited I didn't realize it wasn't happening until then...stay tuned...until then, here is a sneak peek. Plus, I read Solange helped with the styling which makes me want to watch it more! While we are waiting for the video:) Check out Solange's blog/site...which I'm LOVING! Tracee Ellis Ross is launching her new site filled with fashion, beauty and hair tips! This will hopefully make up for her not being on the BET show, Reed Between the Lines. I LOVED watching this and catching all of her ZARA pieces. I bought a bag she carried on the show.